October is National Breast Cancer Awareness Month. The sad truth is that most of us probably know someone that has breast cancer. Last June, someone I knew was diagnosed with breast cancer. She went for her yearly mammogram and something did not look right. Her doctors called her back in for a biopsy. The result was surgery and yet another at the end of June. 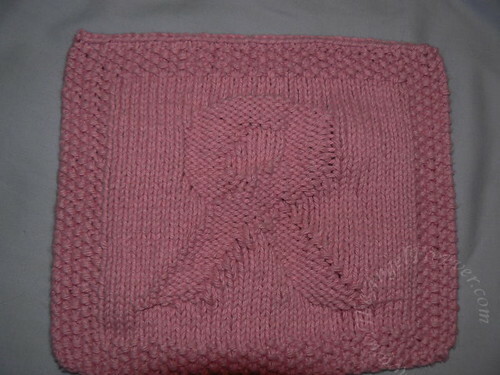 During this time, I knitted this cloth for the new breast cancer warrior. When we parted ways, I gave her a big hug and wished her luck on her surgery. Fast forward to September when I saw her again at school. She looked amazing, strong and was proudly sporting her pink bracelet. Last October, I wrote about a hero of mine. My Aunt S is now a six year breast cancer survivor. I know this because she was diagnosed just before I gave birth to NHL. Thank goodness Aunt S caught her cancer early, fought it aggressively and is with us today adding lots of precious memories with our family. She is a huge part of our family and see her often since we live close. The boys are especially love to see and play Aunt S. Aunt S is special because she will toss on snow pants to play and make snow angels, build sandcastles at the lake, and take time to talk. 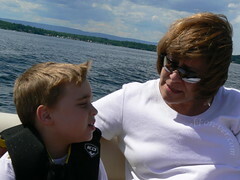 This summer, they spent some time at the lake with Aunt S and the rest of our family. 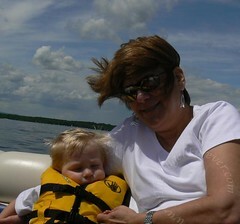 Each of the boys loved their time sitting with Aunt S on the boat with the wind in their hair. Here is Aunt S with each of my boys. Great reminder. Here’s to the ladies who are surviving. .-= Heather´s last blog ..Ugh =-.